Wanna make a mess? As in a good old fashioned, wacky, hard-to-resist, process, action art mess? 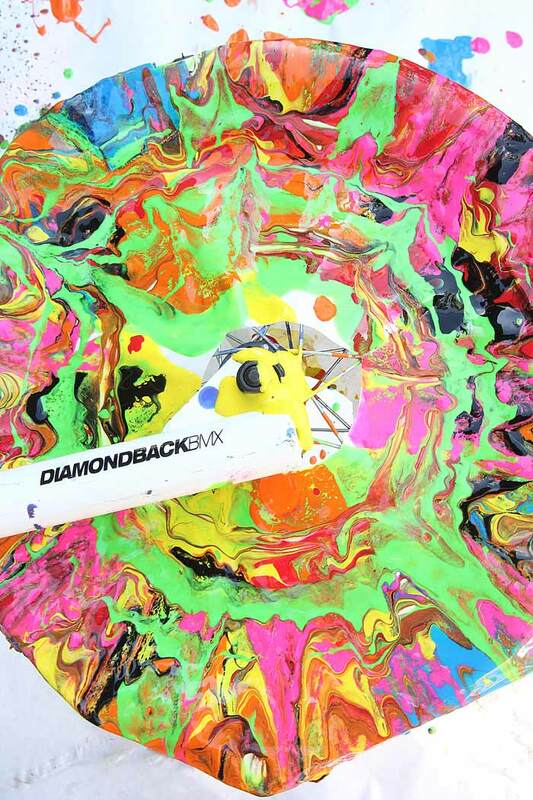 Then it’s time to try our new favorite art supply: a bike. A what? Yup, a bike. 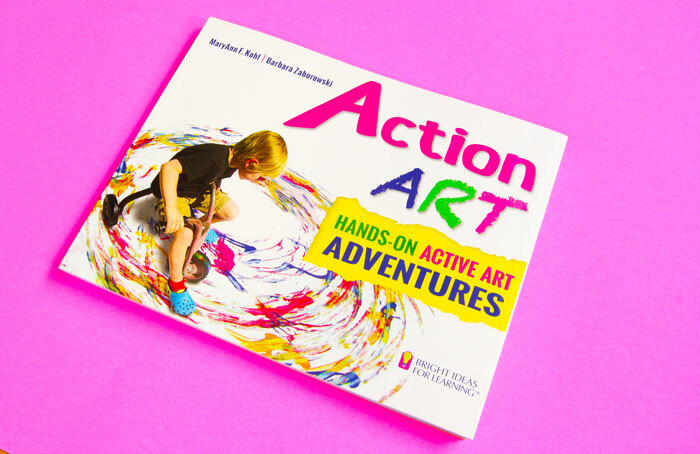 Today’s project is from the amazing book Action ART: HANDS-ON ACTIVE ART ADVENTURES by MaryAnn Kohl. If you aren’t familiar with Ms. Kohl’s work, she is a prolific author of art books for children, many of which focus on process art. 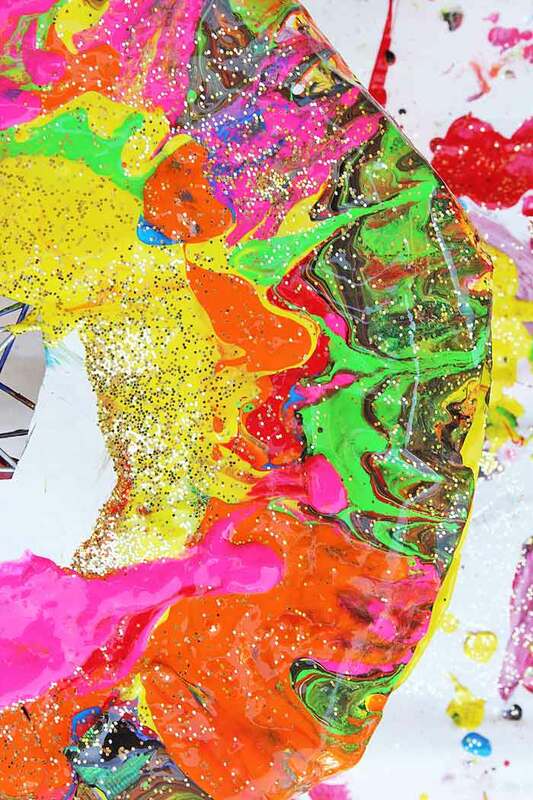 Action Art is her latest work and it’s full of active, engaging, and unusual art experiences for kids. I own a LOT of her books and am thrilled to be part of a book tour launching this latest work, which is sure to delight kids and grown-ups with so many novel art ideas. What is Process and Action Art? For those of you who may be new to the idea, Process Art, the category I would use for action art, is art in which the experience of making is more important than the final work. In fact no emphasis should be made on a final product, but rather on enjoying the process of creating. I’m a huge believer in process art for kids especially at a young age. It’s important for children to learn to value creativity first and foremost without a thought as to whether or not their work ”looks good.” When I was a co-op preschool mom I sometimes watched parents direct their kids during art making and it was heartbreaking. What they learned from such directed art projects is to follow explicit instructions and look to an adult for approval, and those are not the values I believe children should take away from art. Art experiences for young children should place the emphasis on exploration and excitement, not a finished product. 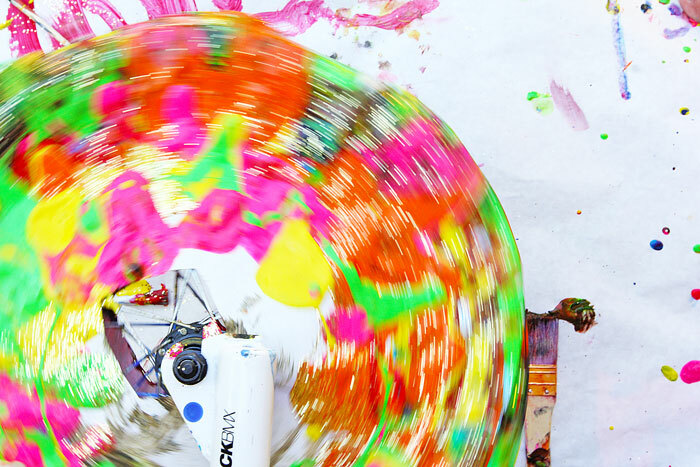 Process Art and in turn, Action Art do just this, so I say bring on the mess!!!!! Warning: This project is MESSY!!!!!! Don’t let that deter you though, prep your space to manage the mess and then forget about it. White Butcher Paper This is the type we use but you can also use brown kraft paper available at the hardware store. Step One Prep your space! Roll out large a large sheet of butcher paper to protect your work area. Alternatively take this project out on a lawn or other washable area. Step Two Cut the butcher paper to fit your bike tire. See diagram below for a rough pattern. We folded a large square of butcher paper in half, then traced a large platter to form the basic circle shape. After that cut out the center and the slit to allow the paper to wrap around the tire. 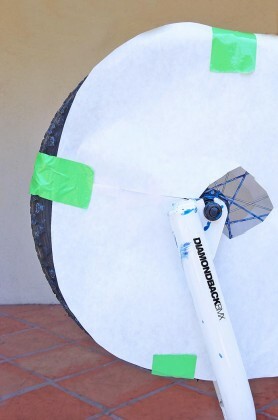 Step Three Tape the paper to the bike tire with duct tape. Tape the open ends of the slits together securely using clear tape so they don’t peel up when painting. Step Four Set up your bike. You can either do this project with the tire positioned vertically or horizontally. Make sure if you place the bike on its side that it doesn’t easily tip over. We positioned the pedals so that the bike was fairly stable. Step Five: Spin and paint! 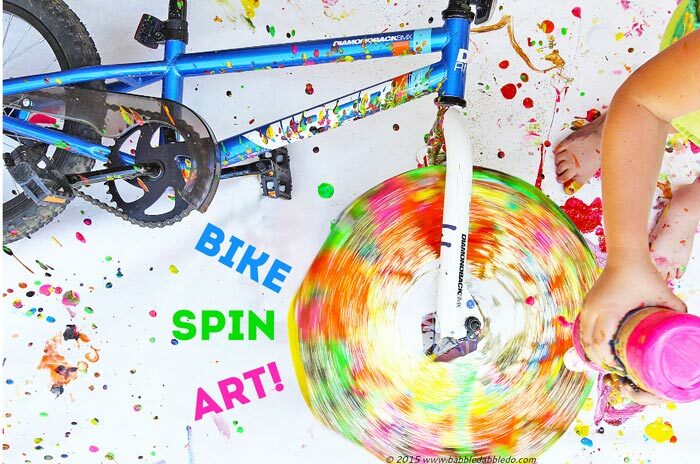 Have fun squirting the paint onto the tire as it spins. 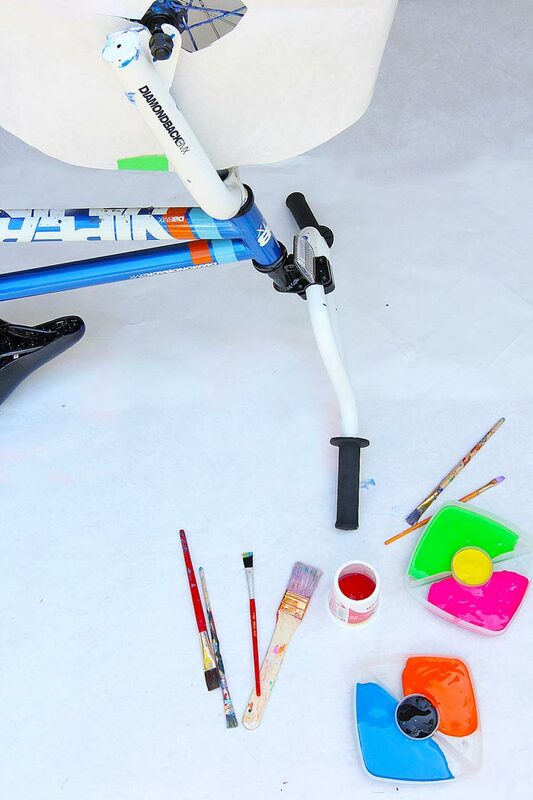 If you are positioning the bike upright, dip brushes in paint and apply to spinning bike tire. Don’t forget to add glitter too! 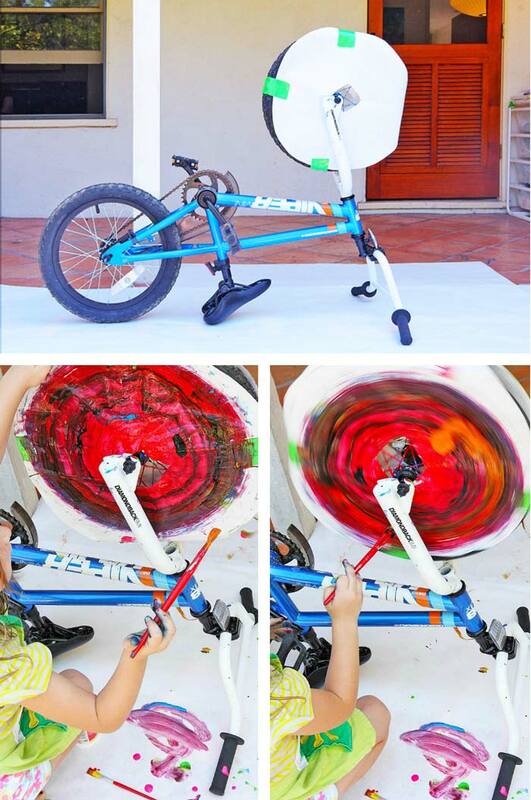 If you did the vertical version of this project you can let the paper dry on the bike, then remove it later. 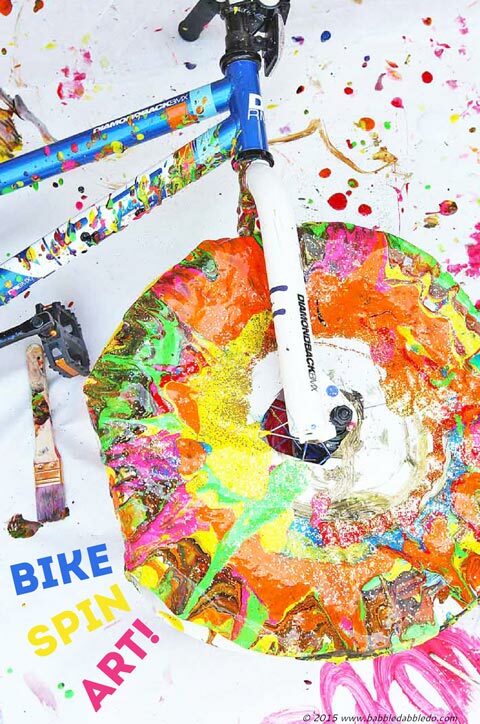 If you did the project in the horizontal position and squirted the paint, most likely your paper will be super saturated and your bike will also be splattered with paint. In this instance you will probably not be able to preserve the paper as you will need to remove it immediately in order to wash your bike. Because the paper gets pretty wet with paint it is hard to remove without tearing it off, however because the emphasis of the project is on process not product, my kids didn’t mind that we weren’t able to keep the final product. The project as shown in Action ART involves mounting a bike tire on a wood block. We opted to simply paint using the bike as is and propping up the front tire in the correct position. USE WASHABLE PAINT! The paint flys everywhere so make sure you are using washable paints. Wash your bike off right away. If the paint starts to set up it will be harder to remove. When using the squirt method, do not leave the paper on the bike to dry as it will also dry on the bike. 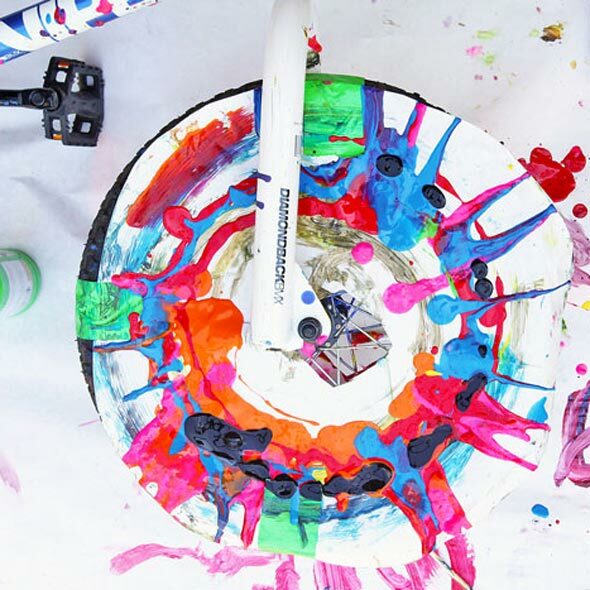 Let kids know not to place brushes near or in the spokes. Yves Klein. I thought about choosing an action painting artist to profile today but instead I decided to talk about Yves Klein. Yves Klein is one of the pioneers of performance art and did a number of paintings using models as brushes- that’s right, he directed models dipped in blue paint to leave imprints on canvases. He is also know for his fire paintings using fire in lieu of paint. To say that he was experimental is an understatement! He is also famous for a photo called Leap Into the Void in which he appears to be leaping out a window onto the pavement below. The photo is actually a photo montage but is very convincing. Yves Klein was definitely a master at redefining art! 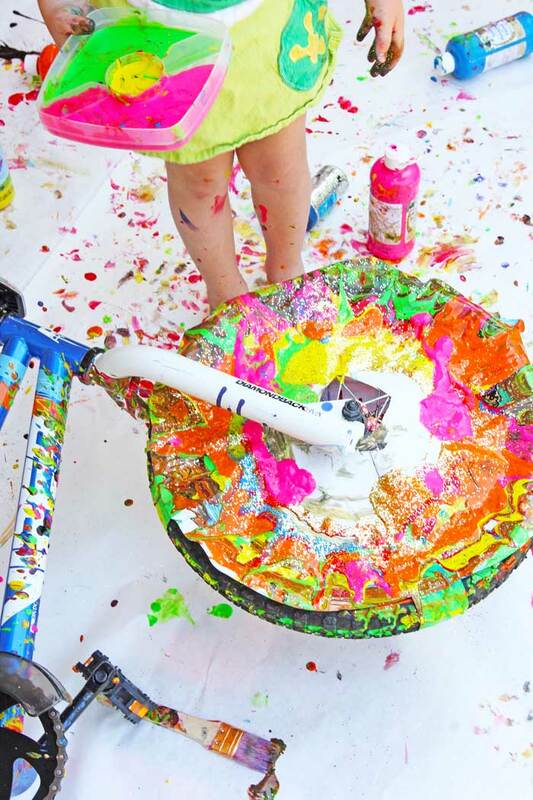 So let your kids get messy! Let them make art like kids, and let them have fun doing it!!! 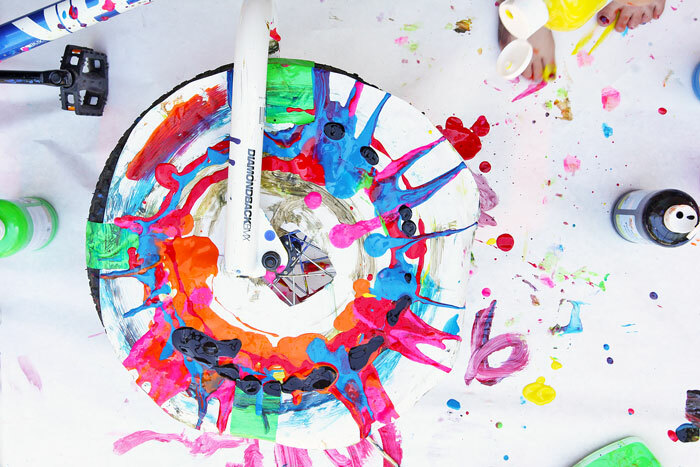 Action ART: HANDS-ON ACTIVE ART ADVENTURES is a great place start letting your kids explore making art by squeezing, tapping, spinning, rolling, swinging, smooshing, exploding! They will love you for it!! So exciting to see our idea interpreted in a new way! I LOVE it!! Oh, wow! My daughter is going to *love* this idea! Awesome one! Great post!. My Kids are gonna love this idea! This will make a mess but i’d love to help my kids make this. awesome!!! how do they do it? it looks like some one riding bike in rainbow. amazingly finished it really appreciate it. great!!! how would they isn’t that right? it would appear that somebody riding bicycle in rainbow. amazingly completed it truly value it. Your explanation of Process and Action Art is an informative one. Many people would be surprised to learn of an art where the experience is more important than the product.